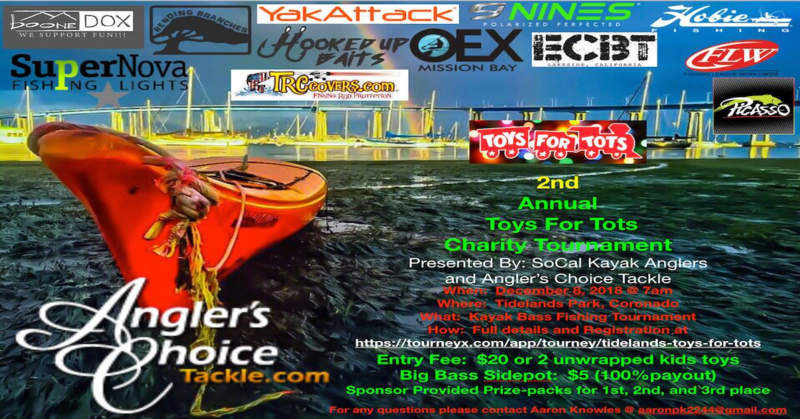 SoCal Kayak Bass Fishing is honored to present the 2nd annual Toys For Tots Charity Tournament. The tournament will consist of scoring the anglers top 3 fish length for the day. In the spirit of giving, there will be no entry fees or cash payouts for this event. Instead, we will require that all participants bring 2 NEW AND UNWRAPPED TOYS to serve as your entry fee. If you would rather make a $20 cash donation, then we will buy your toys after the tournament and present them to the Marines. If you choose to bring toys, please bring a toy for a boy and a girl in the age range of 6 to 12 years old. We also Highly recommend that each participant be dressed to reflect the Christmas spirit (at least a Santa hat but full costumes are welcomed and encouraged). Also feel free to dress up your vessels in any way you see fit! - Electric Motors are authorized. - Scoring will be of your top 3 bass of any species (Calico, Spotted, Sand)!